Sometimes you are working on a project, perhaps finding and fixing a bug, and you can see all the “jumps” the debugger does to actually find the issue. But, when the frustration is all gone I bet you realize the good job that some of these developers have done, because things are there for a reason…sometimes the reason is “I’m just learning new concepts and I used this simple project to apply them and mess with everyone’s mind”… but other times is quite the opposite and they come up with a well, structure and easy code to maintain. So, to the point: should we use abstract classes or interfaces and when? Abstract class: they are base classes that cannot be instantiated. Other classes can derive from them. Note: a class can derive from an abstract class and also implement interfaces. You can only inherit from one abstract per class. To my knowledge C++ is an exception to that rule. 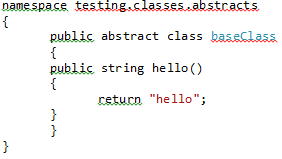 I’m creating a nonsense abstract class with 1 method called hello. Then I’ll have a class that will implement this one. The intention is that in a webpage or a view, you will use it to print the word “hello”. Interfaces: it is like an abstract type that contains nothing really but exposes methods. Then unrelated classes can actually implement the interfaces, this can potentially reduce dependencies and/or make the code reusable. One of things that interface help is because it provides some standard, boundaries if you will. I guess that explanation sound kind of smart. Me, I’m more practical and I believe a better way to understand this is by answering the question: when to use one or the other? Stick around and I’ll try to answer that one. 1) If is not a code that is for yourself only and is not a 1 or 2 month thing that you will put it away and will never use it again, then use abstract classes and interfaces if necessary to make your code easier to read. 2) A project of Medium and over in size that other developers are involved and things like structure, organization, maintenance become important in the short – medium – long run then use them. Important Note: you would never want to overdo something, “over-engineering”. Be careful with that. Everything in life should be in a balance. If you over engineer something then you are also making it hard to maintain, debug (during troubleshooting), and so on. when will you use them (abstract classes and/or interfaces)? Use abstract classes for default functionalities, for classes that have things in common. That way if you need to update something that affects all your child classes then you just go to the abstract and change it there and BUM!, it goes to all of them. If you try to do this with an interface that you might be broken your code and you will have to go to each class and make an update to get it working again. Use interfaces… well I just gave you an example in the definition section. Basically you can apply multiple interfaces to the same class, which is a benefit. It provides structure and boundaries. Once you implement them then your class it is “force” to use the methods define in it, so it provides…I would say consistency.